NEW YORK, US–Malawi has established diplomatic relations with Armenia. 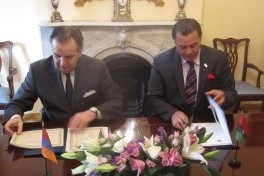 The signing ceremony took place Friday at the Permanent Mission of Armenia to the United Nations in New York. Malawi’s Permanent Representative to the United Nations, Brian Bowler, signed the diplomatic papers on behalf of the Malawi government whereas his counterpart, Garen Nazarian, signed on behalf of the Armenian government. Both envoys expressed joy at the new relationship, hoping it would open opportunities to their two peoples. On its part, Armenia hopes to open its doors to Malawi tour operators to visit the Asian country, boasting of century-old monasteries and other touristic resorts, while Malawi is keenly looking forward to explore opportunities that exist of its tobacco and other agricultural products. Armenia, a large tobacco and grain importer, has a well-established mining industry and Malawi, a neophyte in that industry, hopes to learn from the more experienced Armenians. According to a communiqué released after the ceremony, the two countries have agreed to promote their bilateral cooperation through their diplomatic missions at the United Nations and other convenient diplomatic channels. The two countries are convinced that the establishment of diplomatic relations corresponds with the national interests of both countries and will further strengthen international peace and security. Armenia became independent from the Soviet Union in 1991. Cognizant of the fact that diplomatic relations promote international cooperation and partnerships in areas of common interest, Malawi has in the past six months established formal diplomatic relations with other countries such as Cambodia, Estonia, Slovakia, Montenegro, South Sudan, Mongolia, Georgia, Bosnia and Herzegovina, Malta and Fiji.